The Reinvention of 390 Madison - Walters Group Inc.
Walters is pleased to announce that Feature Walters has been awarded the Specialty Wall scope for the dramatic street level storefront and multi-level amenity spaces at the 390 Madison Avenue office tower (formerly 380). Occupying an entire block on Madison Ave, this will be the most visible of any Feature Walters project in the company’s history. 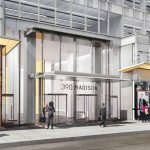 390 Madison Avenue will be undergoing a major metamorphosis. The existing curtainwall and façade are being peeled away and re-massed vertically; creating new terraces, amenity spaces and dynamic new street level retail. It will become a tower bearing no resemblance to what New Yorkers see today. 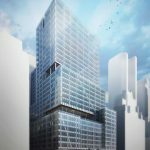 Approximately 18 percent of the former 380 Madison Avenue will be dismantled in its refurbishment, and this mass will be reallocated, boosting the height of the tower from 24 stories (291 feet) to 32 stories (373 feet). 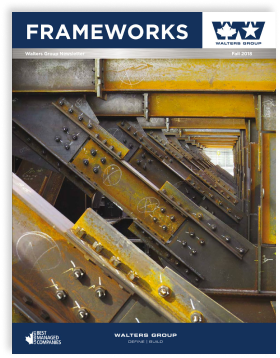 Having recently completed the design assist scope that reconciled the design team’s concept with a custom engineered system, Feature Walters has now launched into final coordination and engineering for production. The awnings and Specialty Walls at the street level retail spaces are the most prominent features in the scope. Accommodating building envelope, structural steel, metal panels, gutters, drains and a spectacular back-lit wood-grain glass soffit; all in a sleek 12” profile, the awning follows a sloping plane that slices through the first and second floors; peaking at the apex of the dramatic, faceted cut through the south-east corner of the building. 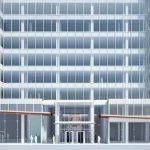 Along with these street level features, the scope also includes a SS lobby canopy, metal panels, railings, a lobby entrance and three more runs of Specialty Walls at levels 9 and 19. The goal with the Specialty Walls was to achieve the greatest level of transparency without the conventional trappings of hardware, curtainwall or support fins. The result of the Feature Walters design assist is full height glass, spanning 25’ vertically with nothing but a caulk joint in the vision zone. 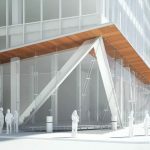 Engineered and detailed in partnership with long-time Feature Walters collaborator; Will Laufs of Laufs Engineering Design, 94.5 tons of structural glass will be installed at three levels using custom engineered glass handling equipment and a small army of glazers. 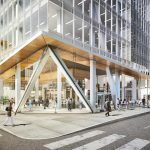 Developed by L&L Holding Company, LLC with Clarion Partners and designed by Kohn Pedersen Fox architects; the project is being touted as the most ambitious re-massing of a Manhattan building yet undertaken. 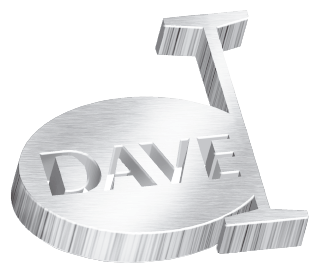 Feature Walters is proud to deliver the integrated systems and finishes of the signature features that will re-define the Madison Avenue streetscape. Vimeo film courtesy of Neoscape.